We are showing a total of 105 discount Exposure Lights, with an average saving of 24% across the range. There are savings ranging from £5.01 for the Exposure Twin Helmet Mount for Flash&Flare or Trace&TraceR at Evans Cycles, up to £130.00 off for the Exposure MaXx-D MK11 SYNC Front Light - 3300 Lumen available at Evans Cycles for £305.0 and the same percentage saving for the Exposure MaXx-D SYNC with 35-31.8mm QR Bracket AW18 from Chain Reaction Cycles at a sale price of £305.0. The top percentage discount is 39.00% for the Exposure Strada 1200 with DayBright Front Light - 1200 Lumen (Ex-Demo / Ex-Display) Black at Evans Cycles, giving a saving of £114.7 reducing the price from £289.95 to £175.25. This level of discount is also available at the following cycle shops: Chain Reaction Cycles, Cycle Surgery, Evans Cycles, Hargroves Cycles, Wiggle, for example giving a saving of £114.45 off the Exposure Strada 1200 with DayBright Front Light - 1200 Lumen (Ex-Demo / Ex-Display) Black at Evans Cycles for a sale price of £175.5. We've found discounts on 12 lights for this model, with the price for the Exposure Diablo SYNC Pack AW18 giving the largest reduction at 38% off, available from Chain Reaction Cycles and saving £116.01. The saving of around £116.01 is available at more than one retailer. and the top percentage discount is also for this model at Chain Reaction Cycles. 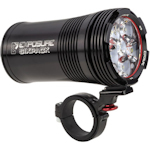 This level of discount is also available at the following cycle shops: Chain Reaction Cycles, for example also giving a saving of £106.0 off the Exposure Diablo MK10 SYNC Front Light Pack - 1750 Lumen at Evans Cycles for a sale price of £199.0. There are discounts available for 7 Exposure Maxx Lights, with the largest reduction being 29% off the Exposure MaXx-D MK11 SYNC Front Light - 3300 Lumen. This is available from Evans Cycles at a price of £305.00, saving £130.00. and the top percentage discount is also for this model at Evans Cycles. There are 8 cycle lights and lightsets currently available at discount prices, with the top saving giving 20% off the Exposure Six Pack MK9 SYNC Front Light - 4750 Lumen at Evans Cycles reducing the price by £97.00. The saving of around £97.00 is available at more than one retailer. and the top percentage discount is 20% for the Exposure Six Pack MK9 Front Light - 4750 Lumen at Evans Cycles.